I suppose I can rename all of the “server” files to “smtpd” files, but then I’m still missing cacert.pem. Am I missing a step? Thanks LinuxGuyF28A4E59, post updated . Just remove that cacert.pem line and rename smtpd. * to server . * .. Thanks for checking .. Fantastic article; right level of depth and explanation. I am new to setting up mail servers on linux, and this article was incredibly helpful. Now have a working mail server for JIRA to use; many thanks! The result for 465 is the same as for 25. All three ports are open in the firewall (25, 465 and 587). I have no idea where to go from here. I suspect that I have missed or mistyped something while following the instructions above, but I have no ideas on how to troubleshoot it to find the issue. did you make port forwording on router ? 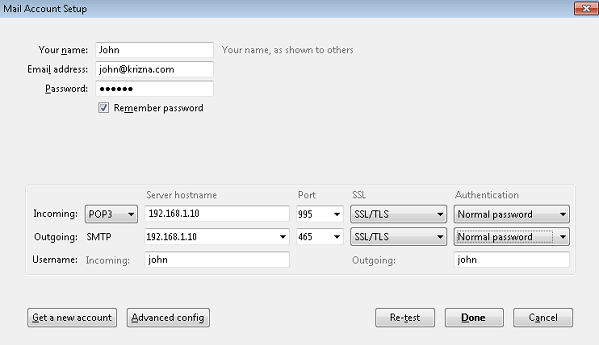 No, no port forwarding on router. I got the same error in Fedora 22. and there must has some error with this doc. You don’t need to forward any ports on your router if you’re doing this within a single network, which I would recommend for initial setup and testing. Once you know it’s working within one network, then forward the ports on your router to permit access from other networks. then postifx will only listen on the link-local interface. The problem is in the /etc/dovecot/conf.d/10-master.conf file. Alas, I was not able to make this work in the end. I ended up using a different method entirely. I cannot set up the connection with SSL/TLS instead of STARTTLS. It drop an error. When trying with STARTTLS setting up the account on Mozilla Thunderbird, it says the username and password are incorrect. Tried many times but could do nothing else. pardon this question, but how did you open the mail GUI…??? How can I access the mail server from UI after completing step 15? How i can enable calendar on my mail server ????? Followed tutorial exactly using a Linode server. Tons of issues. Would not recommend. Thank you for good and useful article. Thank you for the instructions. I have one question – How can I set up multiple e-mail addresses for one user in the same domain? Work great for me on CentOS 7. Running on a google cloud server. Can i setup Mail on Server using Amazon instance EC2 (Centos 7 already installed). I don’t have any domainm i just have elastic IP which is not really static IP or global IP. I just fount this “tutorial” and must say ,,,, useless, doesn’t work on my CentOS 7, can open webmail but whatever i do it seems to not sending email or receiving emails. Please I followed all the configuration steps, but in the end I can not run my email server with SSL support / tls. What should I do? very clear, thanks but i have a probleme with password user. Its not working, i test with mozzila thunderbird, and i have a erro for validating password. Tested and working here, thank you for your time bro. Thank you for the well explained tutorial. If I need to add another domain for the mail service. What changes that I need to do in postfix configuration file? Would really appreciate if someone could help me with the same. I can send emails to other mail servers but if i try to send an email to my new mailserver i always get: “Recipient address rejected: User unknown in local recipient table”. Any ideas? I’m very much new with Linux, at first pardon for my question. Can you please tell me how can I open the mail GUI??? Unable to copy the code from this article!